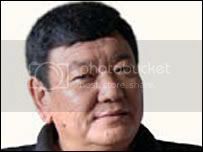 Dr. Sanduk Ruit,the same person who was chosen for the Ramon Magsaysay Award for International Understanding last year,was conferred with the first Reader's Digest Asian of the year 2007 award. Dr. Ruit, a 54 year old Nepalese eye surgeon has conducted over 70,000 successful eye surgeries for cataract,considered to be the main reason of blindness. The eye surgeon did his graduate studies at Lucknow's King George Medical College and postgraduate studies at the All India Institute of Medical Sciences (AIIMS) here. Dr. Ruit has been working in his homeland Nepal(Tilganga Eye Hospital), Thailand, China and many other countries of Asia. Being Nepalese, we are really proud of him but seeing our Nepalese Government doing nothing to honor this great human being is really discouraging and disheartening. He has invented cost effective technology for the treatment of blindness which he has done for not bagging some awards or honour. Nepalese government never saw it's countrymens' real ability or hidden talent to some extent. In Nepal, he serves at Tilganga Eye Hospital,Airport area and later, one can find him at Nemkul Eye Clinic in Newroad too. He is the best Eye doctor in Asia. Few months back i had a chance to volunteere for an eye camp organised by my college club and kathmandu district scout in which the people of ramkot were checked and the selected people were brought to fulhari gumba in gokarna and their surgory was conducted by Dr Sanduk Ruit . You could see the happiness in the face of budo bajeys and bajies after they could see well . It is really great that people like Dr Ruit are giving light to thousand of blind people across remote parts of asia . Speed, that's very nice of you. At least you got the chance to involve yourself into humanitarian activity. Yeah, Dr. Sanduk Ruit is one of a great human being who devised a technology to treat the cataract of poor people. Today, rich ones are spending thousands of bucks whereas with his treatment, one can completely get the same treatment at as low as Rs 100. It's $1.25 cents or something like that. He is a star of millions. People like him are born once in a while. We see lots of doctors are into commercialised treatment but he is not. One who can't afford the expensive treatment will surely bless this great human being.